I intended to create a piece of unique jewellery that celebrates the hidden details in nature, which are often left unnoticed in people’s busy daily lives. This piece was created to enable a person to wear a small portion of the natural world with them wherever they may be. The challenge was to construct a perfect microcosm of the Irish woodlands, which becomes tangible, relatable and awakens a sense of inspiration and intrigue. The inclusions had to be locally sourced, native, and growing in close proximity to one another, in order to create an accurate depiction. 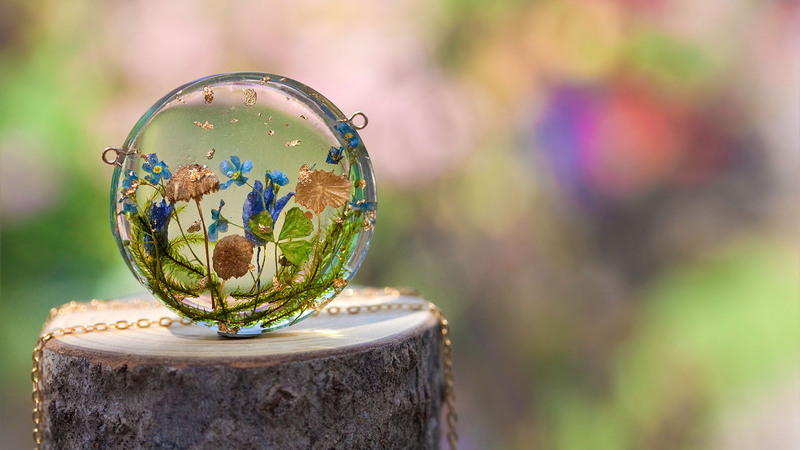 This microcosm was to be designed as a modern looking-glass; with the circular form offering a magnified glimpse of a personal woodland world. My design is an original concept devised by my own inspirations I gather on my daily walks through the local forests. The concept was conceived when I discovered a perfect organic scene on the forest floor; scatterings of mottlegill mushrooms and native wildflowers were flourishing through a bed of moss. I knelt down for further inspection, and to attain appreciation of the tiny specimens. 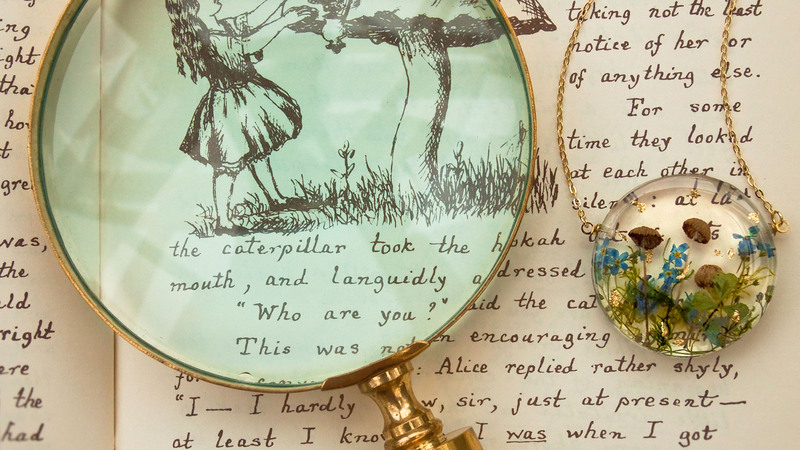 A thought sprung to my mind that a magnifying glass would be a preferable method to observe them, and from there the idea for the piece was born. I had an urge to recreate the very scene within my own looking-glass, and I wanted to make a piece that preserved it in time forever. I firstly gathered a few of the natural elements from the scene, making sure to collect them in a sustainable manner. I carefully preserved them over several weeks in order to retain their original form and colour. I then constructed a silicone mold, casting a piece of curved and tactile vintage glass. Next, I arranged the mushrooms, moss and wildflowers into the mold to recreate the scene, and added flecks of 24k gold leaf to evoke the sense of sun beams piercing through the woodlands. The next phase involved accurately measuring the natural resin to a specified ratio, and degassing the mixture in a specialised chamber to eradicate any air bubbles. This is a crucial stage in the process to ensure a premium and crystal-clear final aesthetic. I then poured the mixture into the mold. After a week of curing, the piece was extracted, sanded using various grades of sandpaper and finally polished to a high gloss shine. Handmade 14k gold fill findings and chain are the last elements to complete the piece. 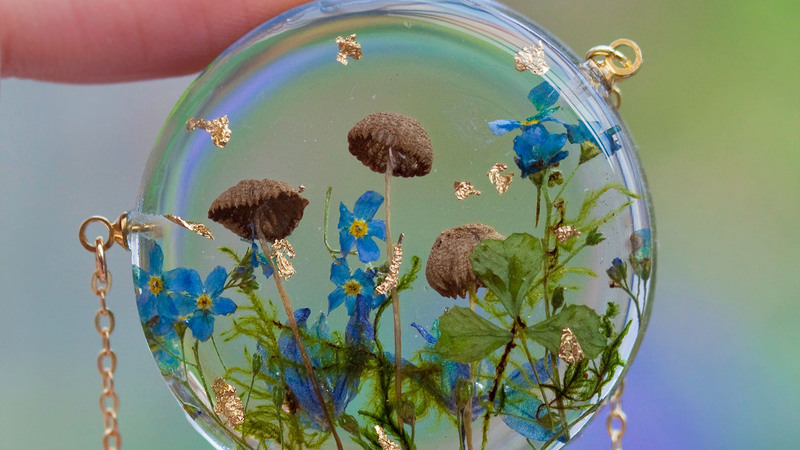 The result is a time capsule of a fleeting moment, encapsulated within glass-like resin. It is a completely one-of-a-kind piece celebrating original design, appreciation of our environment and a conscious acknowledgement of human curiosity and wonder about our world.